Wet, Wet,Wet singer and front man Marti Pellow is playing the Narrator in the Tour of Willy Russell's Blood Brothers until 24th November and he then will be joining the cast of Jeff Wayne’s new Musical Version of The War of The Worlds: The New Generation - Alive on Stage which kicks off at Dublin 02 Arena on 29th November. He will be playing The Voice of Humanity alongside Jason Donovan as Parson Nathaniel, Kerry Ellis as his wife Beth and Kaiser Chiefs’ Ricky Wilson as the The Artilleryman. 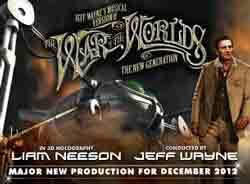 Hollywood star Liam Neeson will appear in the holographic role of The Journalist, taking over from Richard Burton.